Quick and dirty breakfast. We were up way too early, not much is open and the wait for Eggs and Things was longer then we had time for. Interesting architecture. Do you think the architect was inspired by pineapples? Paradise - nature is amazing. It's a wonder how these palm trees stand so tall on such skinny trunks. Helena's - rejected. Who closes Sat-Mon? Apparently they do. Ended up eating at Donburiya Dondon. I should've ordered an udon or saimen. Apparently the texture of the udon is similar to Jimbo's. Kansai Yamato - fresh handmade mochi, so soft they feel like they'll fall apart between your fingers. 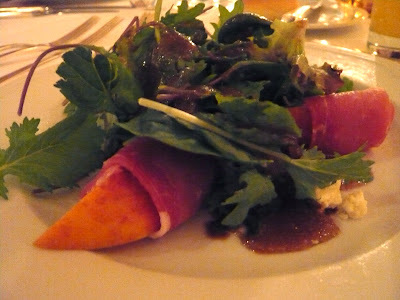 Yummy salad with prosciutto wrapped nectarines. 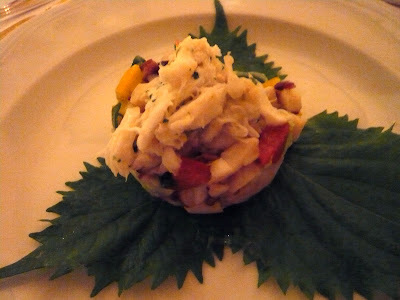 Octopus tartare - good but a bit too chewy. Double the lobster please. 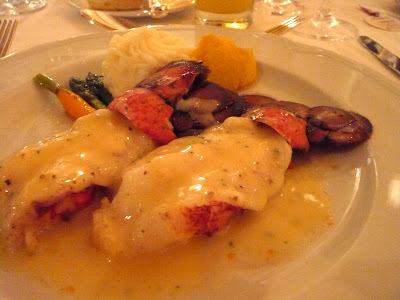 One of the lobsters was supposed to be a steak. So Kelly, who can't eat lobster, got my steak and I got her lobster. Worked out well, I think. Ha. 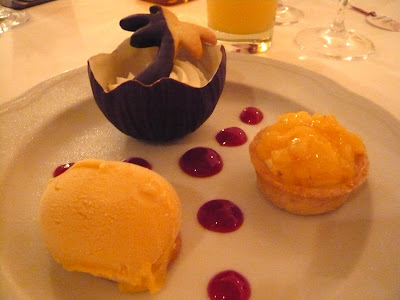 Creamy coconut mousse in a chocolate "coconut" shell, mango tart, passion fruit/mango sorbet. The sorbet and mousse were so flavorful. Friandise was also served. I had an amazing chewy coconut cookie. And... there was also coffee wedding cake. My last meal on the island. Pork and garlic shrimp at the International Market with Masy before some quality time with her family and the little one, who I finally got to meet on this trip. My heart melts. She is adorable. My last glimpse of beautiful, sunny, warm Waikiki before I leave. I couldn't get over how vivid and bright the colors all around were. I really miss this. Next time I want to get more then just an hour or so at the beach, take surf lessons, ride ATVs and motorcycle/scooters around the island, and of course hit all the food places I didn't get to this time. Hawaii, til we meet again, I got some poke, furekaki mix, and masubis to make.